Benefits to the Female Breast: Fenugreek seeds have estrogen like properties which can help increase the female breast size. Underweight women who are worried about their figure can include the seeds in their daily diets to improve their figure and naturally increase their breast size. It is also a boon for nursing mothers. Soak fenugreek seeds in water overnight, and drink this liquid in the day. Fenugreek seeds contain a compound known as diosgenin, a spice that initiate lactation. It helps naturally increase milk production in the breasts. Health Problems in Women: Women have health problems that are different from their male counterparts. Most of these health problems are caused due to the disturbance of the delicate hormonal balance in the female body. Fenugreek seeds contain chemical compounds such as diosgenin and isoflavones. Both of these mimic properties of estrogen. For women who experience menstrual cramps and other problems related to menstruation, fenugreek seeds are truly a godsend. They help regulate the menstrual cycles and ease the symptoms of premenstrual syndrome. Ease Childbirth: Among the other benefits to women, fenugreek seeds have the distinction to help ease the process of childbirth in women. 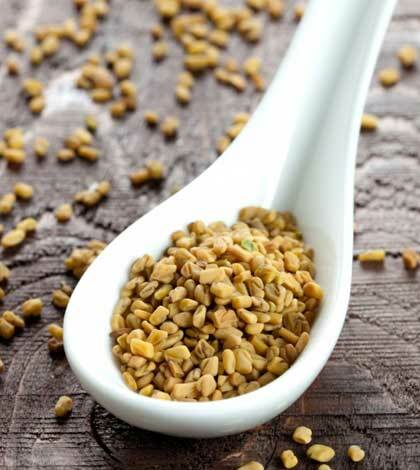 Fenugreek seeds help stimulate contractions during the labor period. Drinking tea infused with fenugreek seeds before beginning of labor can help ease the pain experienced during childbirth. However, pregnant women should consume fenugreek seeds with caution. Owing to their ability to produce contractions, they can cause premature labor or even cause a miscarriage. Ideally women should consume this spice only after consultation with a doctor, instead of using it indiscriminately of their own accord. Cardiovascular benefits: Fenugreek seeds contain compounds that reduce low density lipoprotien or (LDL) which is highly beneficial in the reduction of cholesterol. As cholesterol is lowered, it improves overall health of the cardiovascular system. Fenugreek seeds also contain a chemical compound known as galactomannan which lowers the risk of heart attacks. The spice also contains potassium, which lowers the absorption of sodium in the body and helps regulate blood pressure. Potassium is required for controlling the muscle movements of the heart and maintaining optimum blood pressure. Aid Digestion: Among the many other health benefits of fenugreek seeds, is its ability to improve and aid digestion. It has carminative compounds which help flush out toxins from the body and prevent constipation. Fenugreek seeds can also be consumed to cure acidity and heartburn. Fenugreek seeds improve mucous production in the intestines. This mucous coats the lining of both the stomach and the intestines, decreasing irritation and soothing symptoms of digestive conditions such as irritable bowel syndrome. Control Diabetes: Fenugreek seeds contain a chemical compound known as galactomannan. This is a soluble fiber that slows down the sugar absorption in blood. Fenugreek seeds contain 4-hydroxy isoleucine, a compound that stimulates the secretion of insulin, further increasing and improving sugar absorption in the body. Weight Loss: An unlikely contributor to weight loss, fenugreek seeds contain soluble fibers that help suppress appetite. This prevents you from eating between meals or snacking on ‘junk foods’. Soaking fenugreek seeds overnight and chewing them in the morning on an empty stomach will seem like a very unpleasant experience. However, it effectively curbs your hunger and prevents you from overeating, therefore giving a boost to your weight loss efforts.Also Read- “How to Lose Weight Using Cinnamon Powder and Honey” here. Fenugreek seeds make an interesting addition to curries and vegetable preparations. However, they are also an excellent addition to your beauty regime as well. Adding powdered fenugreek seeds to face packs prevents blackheads and promotes removal of dead skin. Adding them to your hair oil prevents hair fall. Do you now see how a simple kitchen ingredient can be such an all rounder? Fenugreek seeds are certainly a spice you should never run out of. Neha started her career as a research associate with the Azim Premji Foundation and went on to lead several development programs with various NGOs. In her free time she loves travelling and writing.